Supporting the MIA and National Motorsport Week, M-Sport’s Ott Tänak and Matthew Wilson visited a local primary school with an M-Sport prepared Ford Fiesta RS WRC this week – highlighting the importance of road safety and raising awareness of the UK’s multi-million pound motorsport industry. Currently competing in the World Rally Championship with his FIA Action for Road Safety-liveried Fiesta RS WRC, Tänak advised the youngsters on the importance of two of the campaign’s Golden Rules: number one, belt up, and number nine, wear a helmet. 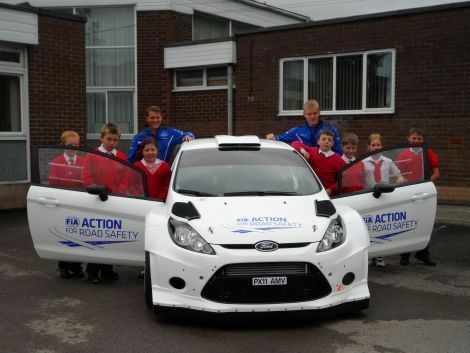 Following an assembly on the importance of being safe on the UK’s roads, students at St. Cuthbert’s Catholic Primary School in Wigton had the chance to take a closer look at the Fiesta’s onboard safety features, sit in the cockpit of a world rally car, hear the engine roar and try a rally driver’s competition helmet for size. In addition, pupils also completed a poster competition highlighting one of the Golden Rules. All students submitted a poster which will be displayed at the school, with Tänak and Wilson selecting the most informative from each year group to receive a selection of Ford World Rally Team prizes. “This was a fantastic opportunity for the children to see first-hand what is being produced on our doorstep at M-Sport – and to see the real thing up close was something I am sure they will never forget. “We are always encouraging the pupils to be safe on the roads, and Ott and Matthew were brilliant with them. Both kept the children’s attention and provided excellent input on how important it is to stay safe on our roads.